Livingston, December 6, 2011: Anthony Poledore (seated) and his attorney listen as Disrtict Attorney Lee Hon speaks in District Judge Elizabeth Coker's Court. 20 Year Old Anthony Poledore Gets 10 Years Probation for His Part in Kimberlin Murder, LIVINGSTON, December 6, 2011 - Anthony Poledore must be breathing a sigh of relief tonight after missing hard time in prison for his small part in the August 2009 murder of Billy Ray Kimberlin, Jr. Poledore was a key witness and cooperated with prosecutors in bringing down the other four in the plot (Quintin Fisher, Omega Manning, Alderick Johnson,and Jermain Clifton). District Judge Elizabeth Coker handed down 10 years probation and a $1,000 fine to Poledore for his part. Poledore admittedly backed out on his part in the plot after he was dropped off in Livingston to help Clifton and Johnson rob the Kimberlins. 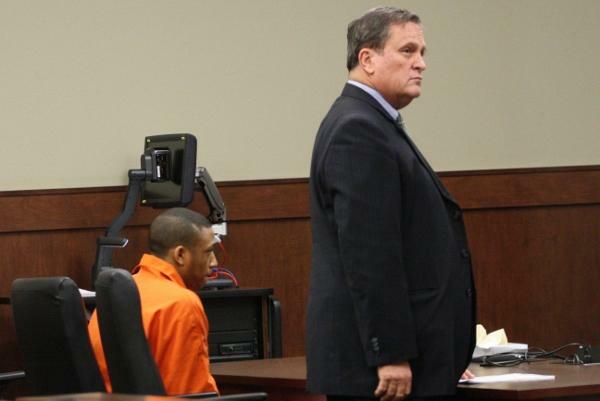 Poledore took the witness stand and still looked like a scared kid that had gotten more than he bargained for when he chose to run with the wrong crowd that fateful August night. From the stand he pleaded with earnestness: "I want to apologize to the Kimberlin family. We all make mistakes, but we must learn from them. I'm truly sorry. I want a second chance", he said as he looked directly at the mother and father of Billy Ray Kimberlin, Jr.
Judge Coker spoke at length to Poledore, "You were in the wrong place at the wrong time..." she said. "Mr. Kimberlin is practicing one of the most basic tenets of Christianity and that is forgiveness", Coker continued "your family believes in you and the Kimberlins believe in you". Poledore's family including his parents and his town pastor were in attendance in the courtroom. Coker instructed Poledore that he would continue his education, and that he would have a curfew. She also stated that Poledore must visit the final resting place of Billy Ray Kimberlin, Jr, and that when called on to speak publicly to students and people, that he must speak about being in the wrong place at the wrong time. At the end of the proceeding, Billy Kimberlin, Sr. addressed Poledore, "I want you to know that it's been a tough journey for us. Our son can never come home, but you can go home", Kimberlin said. "You have faced this judge today, but there's another judge you will face one day. We still have to forgive you and love you because God wants us to. Be good and do right, and that is the best thing you can do for our son". Poledore is supposed to continue his education at Texas Southern University. He has been in jail for nearly 2 years since being apprehended. For more on the murder of Billy Kimberlin, Jr. click here.